Since launching this blog in September 2004, we've heard some interesting transitions from law into alternative careers, but so far this one takes the cake. Matthew Moneymaker is a graduate of the University of Akron School of Law and practicing corporate lawyer who has become a leading "Bigfoot" tracker. As many readers may be familiar, Bigfoot (a/k/a Sasquatch) is the mysterious oversized primate that many eyewitnesses claim to have encountered in remote wooded areas across North America, but whose existence has never been definitively established. 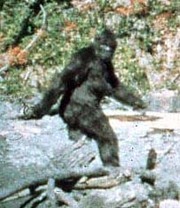 In 2001, Moneymaker wrote and co-produced a Discovery Channel documentary "Sasquatch: Legend Meets Science." In 2002, he co-produced the TV Series "Mysterious Encounters" for the Outdoor Life Network, and in 2003, organized the "2003 International Bigfoot Symposium." Moneymaker's major claim to fame in the "Bigfoot" universe is as the founder and director of the Bigfoot Field Researchers Organization, which is dedicated to resolving the mystery surrounding the Bigfoot phenomenon through investigation of reported sightings, and organized expeditions into remote forests in search of evidence of the elusive beast. Hey, maybe Bigfoot was a lawyer too?